The South Sioux City Extended Campus is located at 1001 College Way, South Sioux City, Nebraska. This location offers you the opportunity to gain skills to start your career or build a strong foundation for your bachelor’s degree. Start your success by taking general study courses and program focused courses from Northeast. You will then be able to seamlessly transfer to Wayne State to take your upper-level courses without ever having to change locations. When it comes to your degree, we believe that you should never have to compromise quality for convenience or cost. That’s why we take an approach that combines all three – so you can have more control over your education and your future. Start your success today. Apply early for admission and financial aid. Partnership Programs - These programs may require attendance at a partner institution. Classes are available for both English as a Second Language (ESL), Adult Basic Education (ABE), and Preparation for the Nebraska High School Diploma. Business & Industry programs provide training and educational opportunities for individuals seeking career advancement or wanting a new career, displaced workers, and employers seeking a competitive edge. We are the trusted leader and provider of on-site, customized training and development that fits the needs of each individual client while helping revitalize the region we serve. We are able to connect businesses with the workforce resources and training needed to help strengthen and grow our region and beyond. We provide customized training - anytime, anywhere. 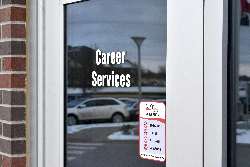 Connecting you with the resources you need allows us to become your partner in workforce development. 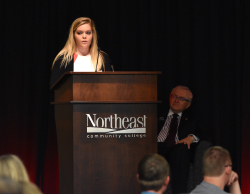 by jamesc 4/19/2019 8:16:36 AM -- NORFOLK, NE – Northeast Community College celebrated the generosity of those who have given of their resources to ensure that students are allowed to pursue higher education degrees. Students and their sponsors sat together and heard inspirational stories during the College’s Annual Scholarship Luncheon held in the Lifelong Learning Center recently. 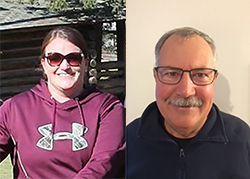 SOUTH SIOUX CITY, NE – The Visiting Speaker Series at Northeast Community College in South Sioux City continues with two additional speakers scheduled. NORFOLK, NE - Kids will have the opportunity to take to the skies and become junior drone pilots at a camp being offered this summer at Northeast Community College campuses in Norfolk and South Sioux City. WEST POINT, NE – A majority of Northeast Community College graduates found employment opportunities or are continuing their education, according to a new survey. The 2018 Graduate Report confirms that 99-percent of 2018 Northeast graduates either found jobs or continued their education. 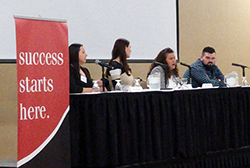 by amandab 4/11/2019 8:51:42 AM -- NORFOLK, NE - Several high school students from Nebraska and Iowa had the opportunity to gather, get motivated and learn more about higher education opportunities at a youth summit held here recently.